We have a huge project Idea this year for the Fremont Solstice Parade. It requires time, practice, and costumes . Exciting! YIPPY! We got a grant for for music this year! We have been in the parade for over 20 years and have had over of 1000 participants if we add up all the years (maybe even 2000, wow!). We share our pride and passion for belly dance! This will be the first year we will have melody lines as well and a drum core to facilitate our ambitious dance project ! More music details below. http://www.silkroaddance.com/ and belly dances by Delilah. We need a large cast. We are going to do short dances of Bollywood, Belly Dance, Uzbek and Persian and we are inviting dervishes to participate. The music has been chosen, and the ethnic dances have already been choreographed by Laurel Victoria Gray director of the Silk Road Dance Ensemble in WA DC when she was in Seattle last November. All dancers will learn all parts but be costumed for certain themes. More details for costumes will be online soon. Saturday May 5th SAM/ . Members of Silk Road Dance Company are being flown out to perform at the Asian Art Museum as part of the COLORS OF THE OASIS Exhibition. Don’t miss it! Evening and matinee show times. Sunday May 6 th 5:30-6:45 FREE and open to the Community! Introduction to Parade Drumming with Erik Brown; Bring a dance drum. Immediatly following 7:00-8:00 Lecture “Dances of the Silk Road; In the Spirt of Community” by Laurel Victoria Gray Snacks and refreshments. Monday May 7th Special Silk Road Workshop 7:30-9:00. This extra night is so as many dancers as possible can participate. She will also attend the first week (1 of 6) of regular Parade Classes. Tuesday May 8 7:40-9:00 and Wednesdays May 9.7:40-8:50. The rest of the classes May-June will be Tuesday and/or Wednesday nights 7:40-8:50. TWO FOR THE PRICE OF ONE , Plus more. Dancers choose to register for Tuesday or Wednesday, but can come to the other nights as much as they want. The extras are the Sunday drum and lecture, Monday Special Dance Night with Laurel Gray and access to the Thursday Costume Clinics. After party at Delilah’s on June 30th. All Dancers will learn all dances! The cost is $95 come at least once a week. Pay Online $98 please send in or drop off a registration form. Registration form, Be sure and right TUESDAY or WEDNESDAY PARADE CLASS. There are 3 Thursdays May 17, 31 June 7 devoted to costume assistance and prop construction that are included. Thursday June 14 is MANDATORY DRESS REHEARSAL. That makes the total number of class options 18 classes and events, plus the Solstice Parade event Saturday June 16 and a AFTER PARTY on Saturday June 30th. • Saturday Fremont Solstice Parade is June 16 10AM dressed and ready to go. Nothing gets done with out money and volunteers. We understand the economy has been really hard. In fact Visionary Dance is sadly closing it’s doors this summer. Lets make this parade a really special one! Your Dance class dollars are going towards teachers,supplies and overhead plus air fare to fly out Laurel Victoria Gray, our guest Dance Choreographer from WA DC. More about costume information will be online soon. fill it out and send it in with a check. We also have a mail slot at the Studio. 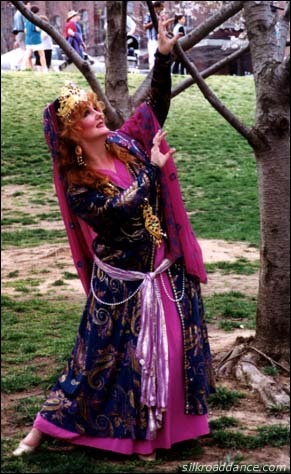 Delilah is an internationally acclaimed belly dance performer and instructor. Recognized and honored as American Pioneer in Belly Dance at the 2010 International Belly Dance Conference in Canada, (Toronto). She was the first dancer to receive the Dancer of the Year Award from the International Academy of Middle Eastern Dance in Hollywood, California 1997 and winner of the annual Walnut Creek Belly Dancer of the Year Contest of the year in 1977. She opened VDP Studio in 2004 in the Fremont Neighborhood and has been in the Solstice Parade for over 20 years!